Beginning this morning, Baidu began providing real-time search services from the top four weibo service, including Sina, Tencent, Netease and Sohu. In other words, the search results on Baidu will now include microblog posts from these four major Chinese Internet major portals’ microblog services. Baidu will even return up-to-date Sina Weibo content that matches keyword searches for breaking news or popular trending topics, and the real-time search result will be displayed near the top of the search engine results page. The official press release highlights the partnership of Baidu and Sina with quotes from high level officials of both companies. When Chinese Internet users need to find something online, they turn to Baidu. We process billions of search queries on a daily basis, and many of those queries are related to the real-time information found on microblog posts. With this deal between Baidu and Sina Weibo, Baidu has completed its integration of high-quality content from China’s four leading microblog platforms. As China’s most influential online social networking platform, Sina Weibo has always seen open platform as its direction for development. Sina hopes to encourage the continuous development of China’s Internet industry by actively cooperating with other major online platforms. To date, Weibo has accumulated more than 300 million registered users, and logs more than 100 million microblog posts daily. Sina is excited to further expand the influence of its Weibo service by cooperating with a search engine, as it is a highly efficient channel for extending the reach of quality real-time information to more netizens. Real-time information is always the most precious value provided by microblog service. Google wanted to acquire Twitter and later integrated Twitter’s real-time search result, which leaves me no surprise Chinese weibo services now partner with a leading search engine. Good news, indeed. I thought that Baidu will now return real-time results on anything users search for, but I was wrong about it. As Kaiser Kuo, the Director of International Communications of Baidu clarified, the real-time results appear only when you search for breaking news or popular trending topics. That makes some sense, as people may more care about real-time updates on breaking news. The result page may looks messy if we return all real-time results for anything searched, Kaiser explained. Hm.. But still, I would suggest that at least Baidu could give a switch button which allows users to switch on/off real-time search. 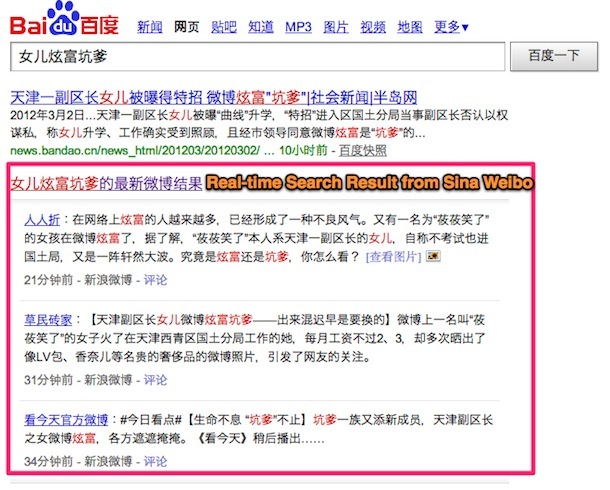 Note that Sina Weibo officially launched its own search service last October. So how Sina is going to monetize its real-time information next?